I went to North Broad Friday to photograph the MARC train on its "last day". 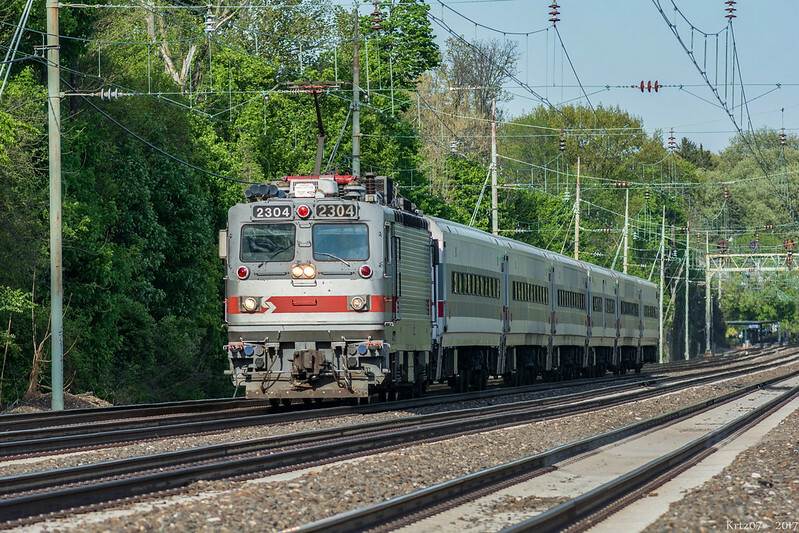 While I was there, a friendly conductor told me that if I was there to photograph the MARC train, Friday was not its last day. The train previously used a SEPTA cab car, but on Friday it had MARC 7747. The MARC set was 7 cars today with both cab cars on the train. Maybe today is finally their last day at SEPTA. South Jersey Budd wrote: The MARC set was 7 cars today with both cab cars on the train. Maybe today is finally their last day at SEPTA. Currently the MARC set is at Penn Coach yard with the engine removed from the consist. Looks like this would be like last photo of the MARC set which I've taken last Friday. Philadelphia Transit Vehicles :: Covers Philadelphia with expansion to Delaware, New Jersey and PA.
...although having the GP40WH2 do it would actually be a sight to see! It was a good run while the AMTRAK, NJT & MARC equipment was around. Thanks to all who posted pictures, I enjoyed them all. Look forward to SEPTA's own sprinters coming. And thus closes a chapter of SEPTA Regional Rail agony that I'm sure they hope to never have to experience again. Yes, it was agony from many perspectives but it was also fun having the varied equipment on the property. Kudos to SEPTA and the lending agencies in mitigating a terrible situation. Hearing chatter that the powers that be are considering trying to get some of the MARC equipment again. Don't know if lease or outright purchase. We shall see. boomer wrote: Hearing chatter that the powers that be are considering trying to get some of the MARC equipment again. Don't know if lease or outright purchase. We shall see. They're probably going to lease them until they get the multilevels because they'll have extra ACS-64s in the yard doing nothing.